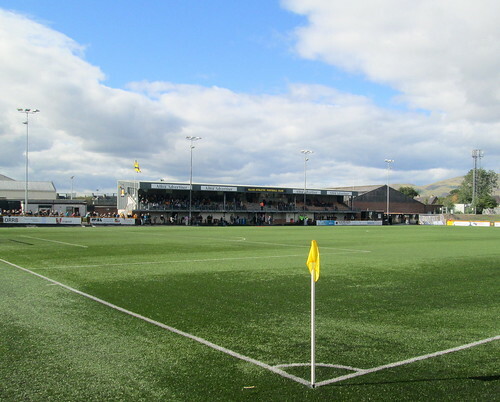 In all my visits to Recreation Park up till a couple of years ago there was no railway behind the ground: it had been Beechinged. 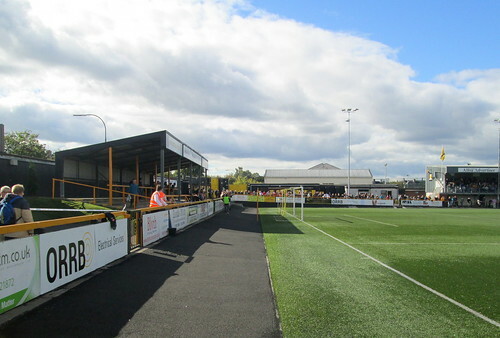 However, my elder brother told me of some Dumbarton player in the long ago putting a penalty onto the railway. The modern line from Stirling to Alloa (and beyond for goods trains) opened three or four years ago. 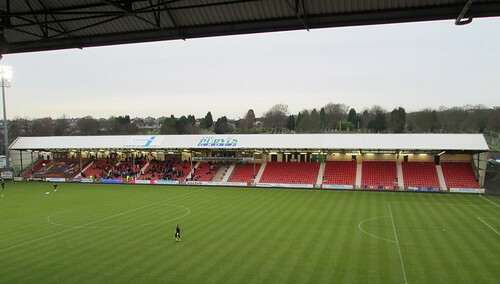 The next photo is shifted right slightly to show the away support area. 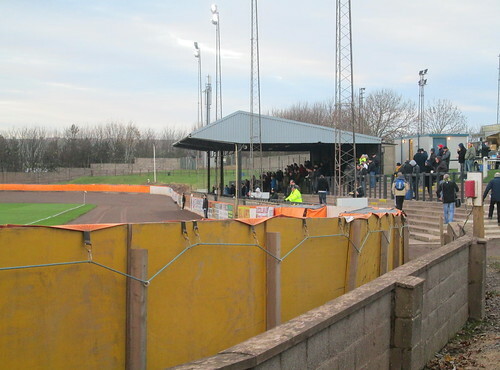 Note temporary stand halfway down. 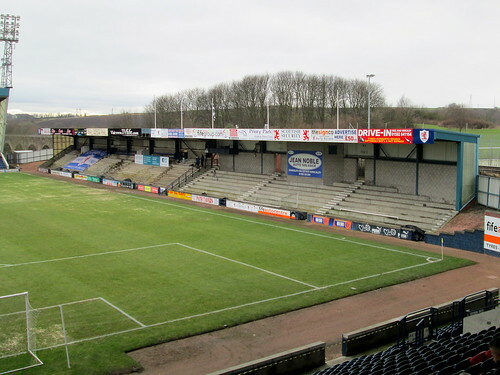 There used to be a large mound of terracing on this side, with a covered area well back from the pitch. It was taken away a few years ago and replaced with this flatter viewing area. 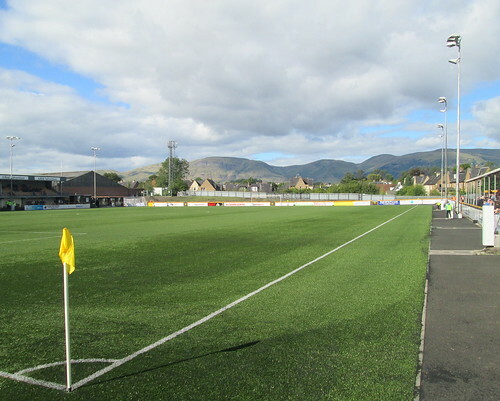 Again a nice view of the Ochil Hills in the background. 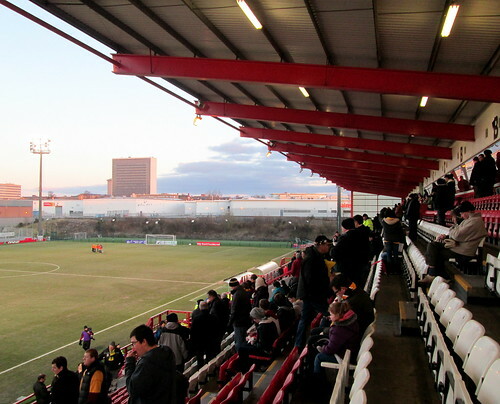 The stand replaced one damaged by fire quite a few years ago now. 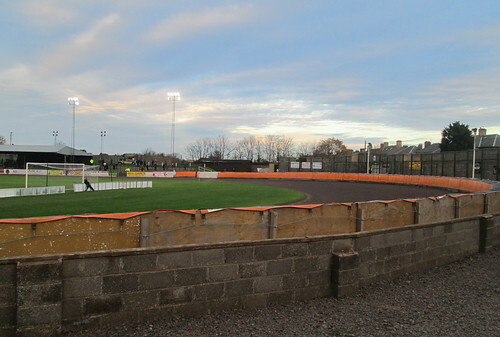 This is it from the Railway end. 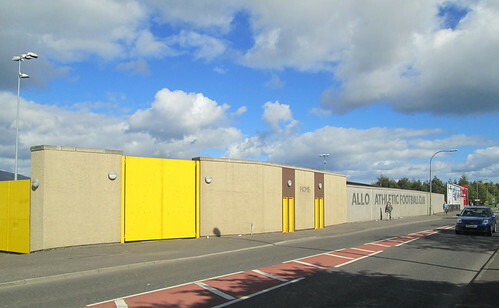 I’ve read recently that the wonderfully named Scottish junior team Kirkintilloch Rob Roy FC is to be moving from its home at Adamslie Park, Kirkintilloch to pastures new. 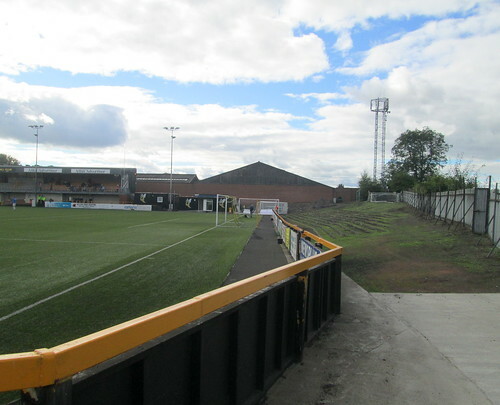 I gather the team will temporarily be playing its games at the ground of Kilsyth Rangers until the new ground is ready. 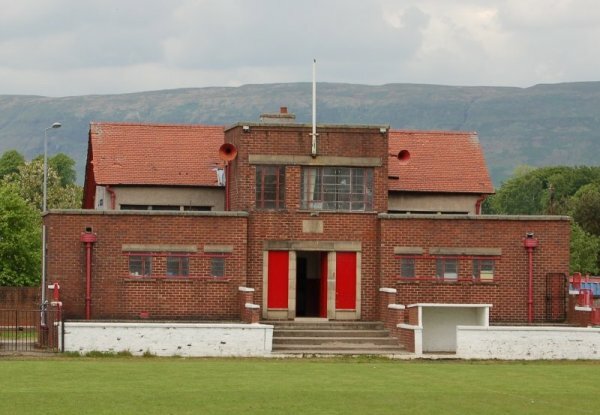 Out of the corner of my eye as I was driving through Kirkintilloch I once caught a glimpse of the Pavilion at Adamslie Park and immediately thought it was Deco. 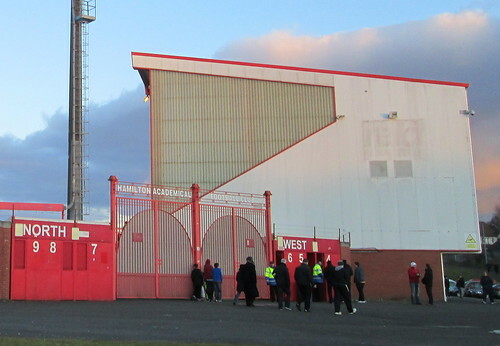 I have never been inside the ground to see properly for myself and will likely now never get the chance. So here are two photos I found on the web. 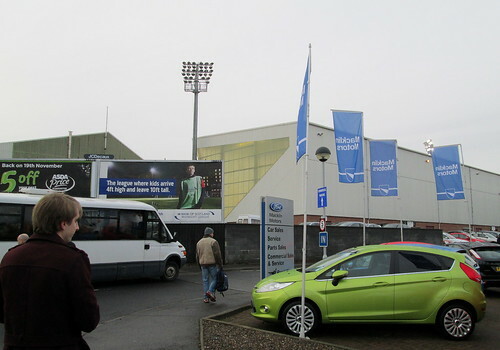 The second is taken from the club’s website and shows what must be last season’s team posing in front of the Pavilion. I also found this video on You Tube but but doesn’t show off much of the Pavilion. 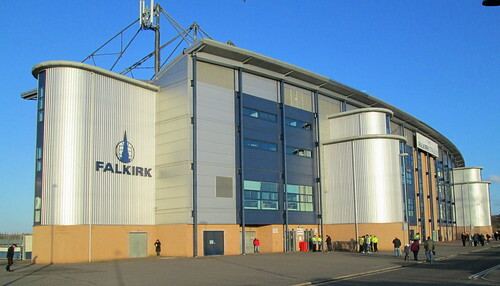 Home of Falkirk FC. Quite an impressive one now that all but one of the sides is closed in. These photos are from April this year. 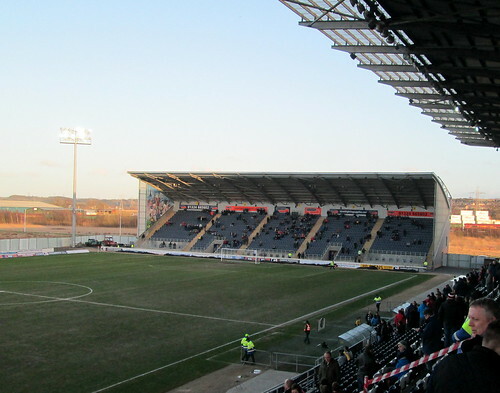 The last time I was there some years ago it only had two stands. Still an improvement on the old Brockville though. 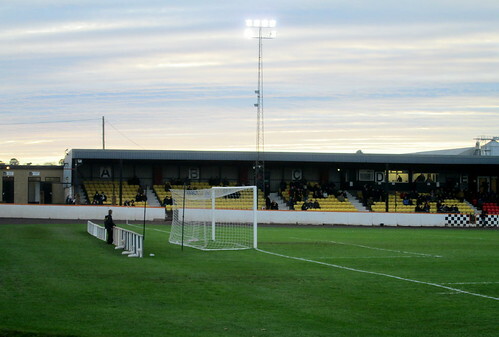 This is the Main Stand. I took this one from the road just to the east. 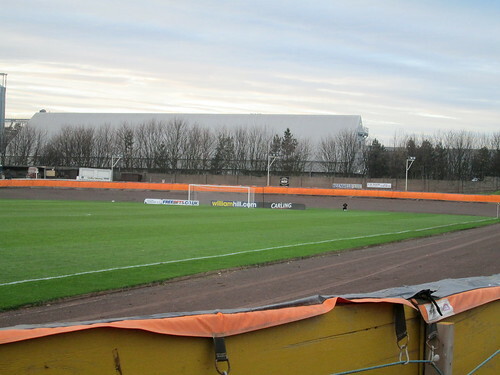 This is the view across from the Main Stand. 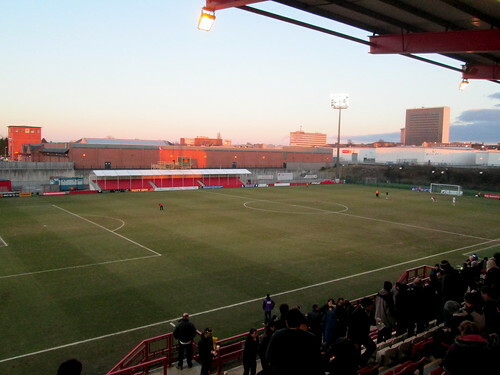 Home of Hamilton Academical Football Club, popularly known as the Accies. 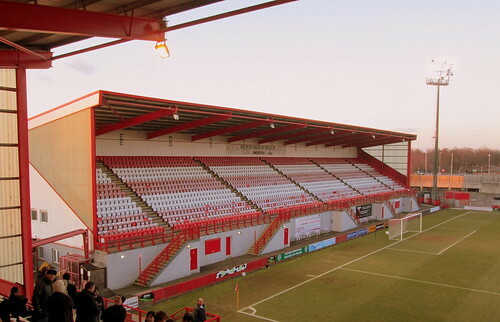 The Main Stand is the one you can see in the above photo. Once you get inside you find the seating area is quite high up. See the steps. 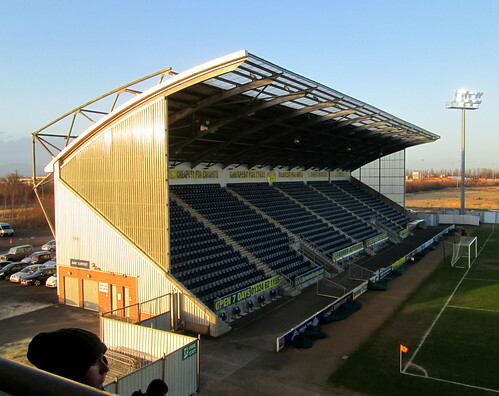 Note no stand to right here and the temporary stand on the opposite side. 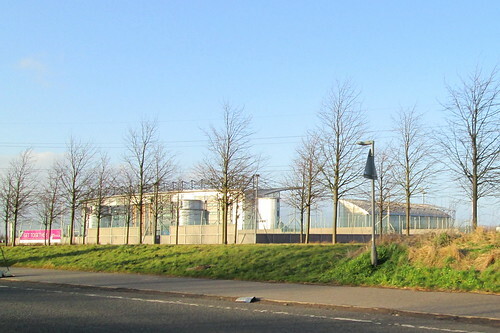 That’s a Morrison’s supermarket behind it. 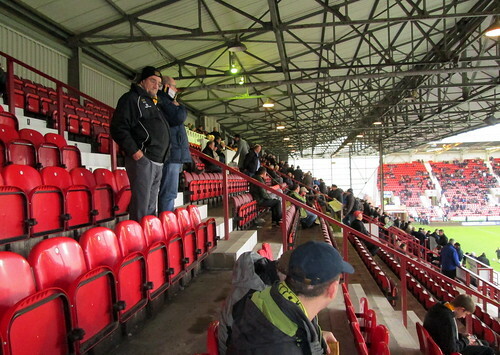 Apparently Sons fans were in this stand for the Saturday game but it wasn’t used on the Tuesday night. 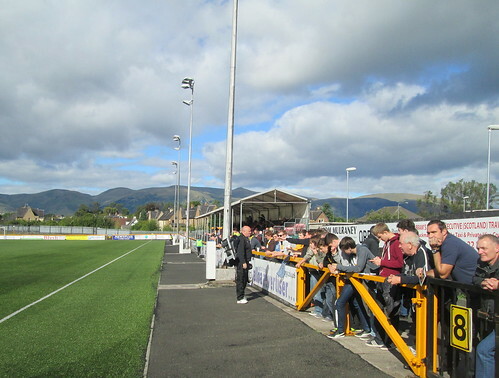 A few more photos of New Douglas Park are on my Flickr. 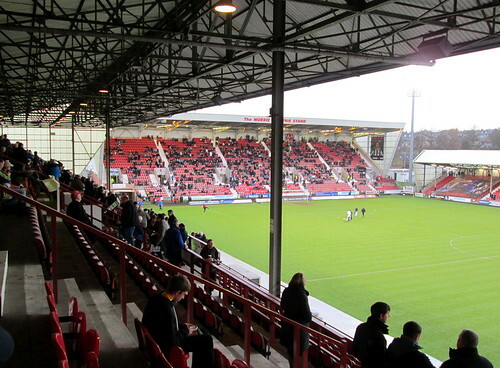 Dumbarton are due to play at East End Park, home of Dunfermline Athletic Football Club, on the 23rd, a week today. 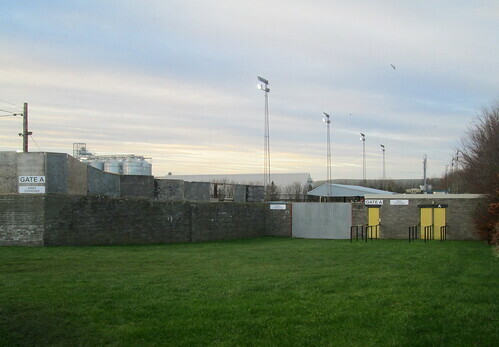 We last played there on Jan 5th when I took these photos. 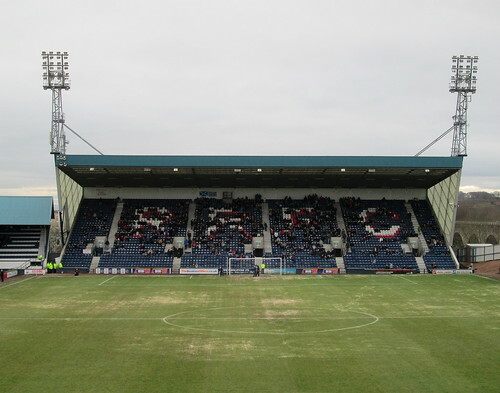 The Pars, as they are known, are in financial trouble; so take a good look at these as they may become historical curios. Yes, there’s a cemetery over the wall from the ground. 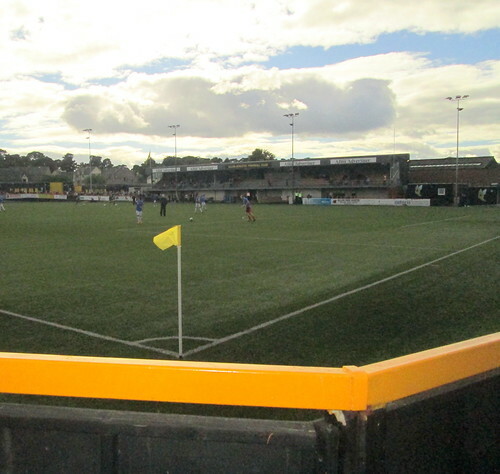 This is a stitch of two photos to get the whole ground in. 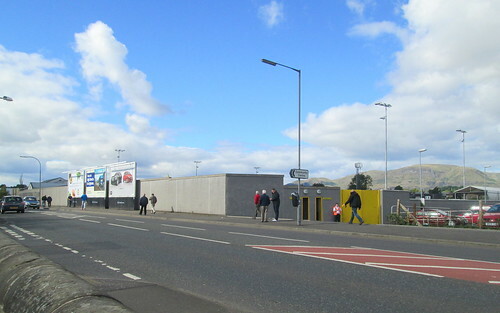 Norrie McCathie Stand (West Stand; at far end.) Named for a former player. Home support. 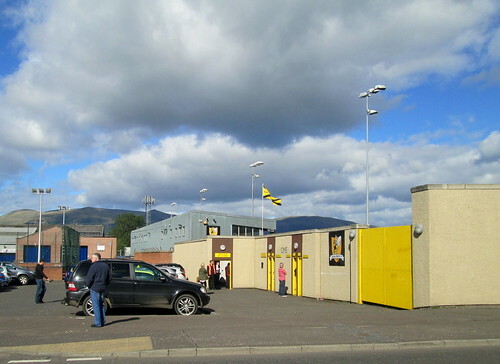 Main Stand. 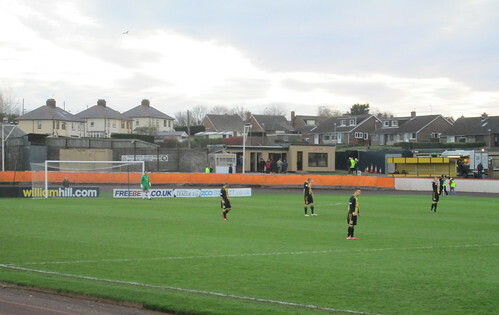 Away support in foreground, home support in bulk of stand. 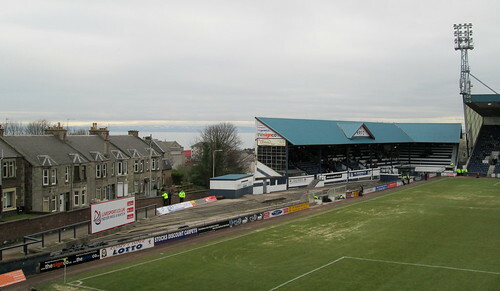 This side of the ground houses the old main stand at Stark’s Park with its round-the-corner construction. I don’t think I’ve witnessed anything like this at any other football ground. I assume the line of the road prevented building beyond the halfway line. 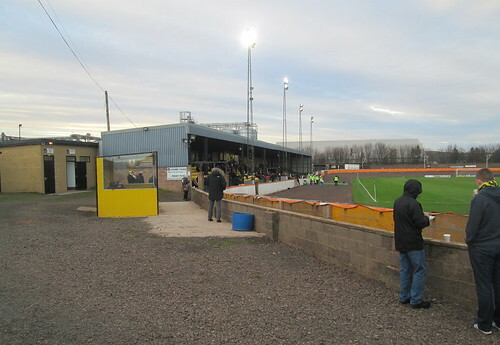 This is the adjacent home stand, a clone of the McDermid Stand at the other end. 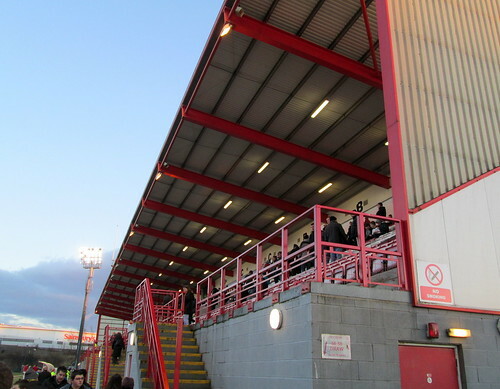 And here is the disused Railway Stand. 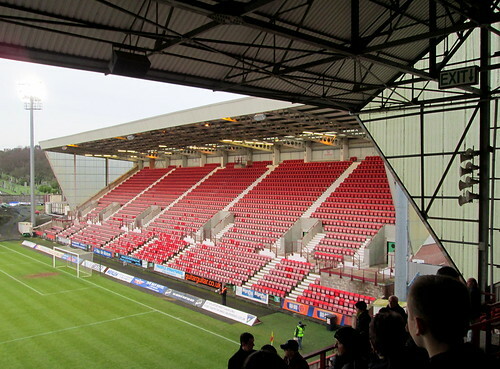 Many supporters would like to see this opened up as terracing but the authorities in Scotland don’t go much for all-seated stadia reverting to standing. areas. 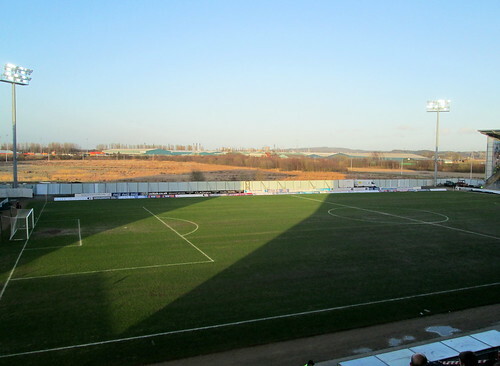 Note the state of the pitch last Saturday. It’s amazing football broke out at all.